Orphaned Lark Alfen is taken to his new home by distant relatives. It's been said that his late mother was a vampire, so everyone is scared of him and doesn't want him around. He gets bullied a lot until, one day, he meets a black-haired boy named Setz who has red eyes like him. They become friends. But as a rumor spreads that Lark is also a vampire, his guardians decide to send him back to the orphanage. 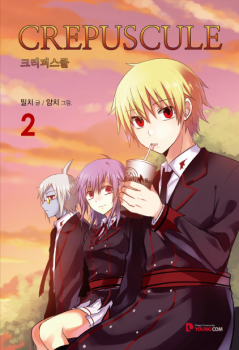 When Lark hears about their plans, he decides to run away, and Setz invites him to his home... in the world of real vampires.Please address this work as a Manhwa (Korean word for cartoons)As of February 2011, the current storyline was dropped due to TieRo leaving the project. I has restarted from the beginning with a new author. There are differences in artwork and plot. Oh, this thing’s still kicking around? this manga has gone downhill. Maybe I’ll give it another chance if it ever gets completed. This is a really good series i want to see more but if there is more chapters hopefully they use a different translator than was used in the last few chapters because I’m slightly confused on what happened. You know when in a movie or something when a character dies but then their corpse twitches and your like OMG THEYRE ALIVE!!! That’s basically what just happened to me with this. Absolutely love this and I’m glad people are translating again, but please dont let it only be 2 chapters. this is a nice manga, and i would love to read it more and more, please update this one, thank you. when will be this going to update? Translation sux big time, whoever did it used google translate and poorly at that. So happy this has started back up!!!! is this series cancelled or what? this manga’s story build up is really slow..